Founded in 1980, Western Neurosurgery, Ltd. has been dedicated to the advancement of patient care in the Neurosciences. This physician group of neurologists and neurosurgeons has subspecialty training in a variety of areas including neuromuscular disorders, stroke, brain tumors, epilepsy, disorders of the spine and surgical treatment of Parkinson's disease. 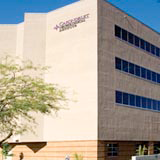 Western Neurosurgery physicians are an affiliated partner of the Carondelet Neurological Institute on the campus of St. Joseph's Hospital and utilize the latest in technology for the comprehensive treatment of neurological disorders.